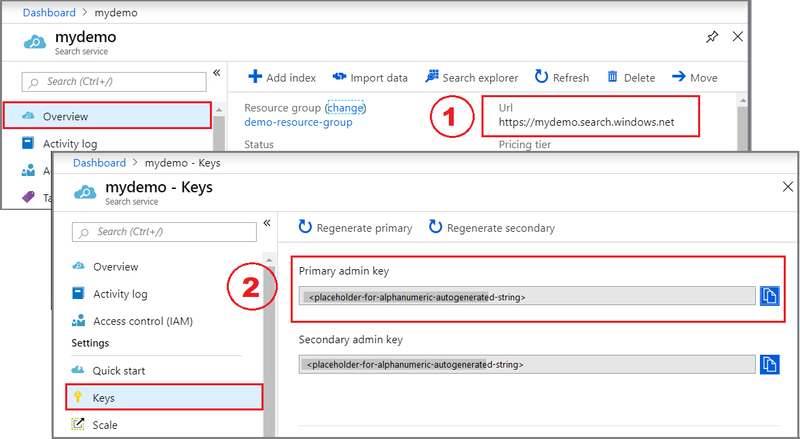 This article walks you through the process of creating, loading, and querying an Azure Search index using PowerShell and the Azure Search Service REST API. The index definition and searchable content is provided in the request body as well-formed JSON content. The following services and tools are used in this quickstart. Create an Azure Search service or find an existing service under your current subscription. You can use a free service for this quickstart. PowerShell 5.1 or later, using Invoke-RestMethod for sequential and interactive steps. Sign in to the Azure portal, and in your search service Overview page, get the URL. An example endpoint might look like https://mydemo.search.windows.net. In Settings > Keys, get an admin key for full rights on the service. There are two interchangeable admin keys, provided for business continuity in case you need to roll one over. You can use either the primary or secondary key on requests for adding, modifying, and deleting objects. All requests require an api-key on every request sent to your service. Having a valid key establishes trust, on a per request basis, between the application sending the request and the service that handles it. In PowerShell, create a $headers object to store the content-type and API key. You only have to set this header once for the duration of the session, but you will add it to every request. Create a $url object that specifies the service's indexes collection. The mydemo service name is intended as a placeholder. Replace it with a valid search service in a current subscription throughout this example. Run Invoke-RestMethod to send a GET request to the service and verify the connection. Add ConvertTo-Json so that you can view the responses sent back from the service. If the service is empty and has no indexes, results are similar to the following example. Otherwise, you'll see a JSON representation of index definitions. Unless you are using the portal, an index must exist on the service before you can load data. This step defines the index and pushes it to the service. The Create Index (REST API) is used for this step. Required elements of an index include a name and a fields collection. The fields collection defines the structure of a document. Each field has a name, type, and attributes that determine how it's used (for example, whether it is full-text searchable, filterable, or retrievable in search results). Within an index, one of the fields of type Edm.String must be designated as the key for document identity. This index is named "hotels" and has the field definitions you see below. The index definition specifies a language analyzer for the description_fr field because it is intended to store French text, which we'll add in a later example. Paste this example into PowerShell to create a $body object containing the index schema. Set the URI to the indexes collection on your service and the hotels index. Run the command with $url, $headers, and $body to create the index on the service. For verification, you could also check the Indexes list in the portal, or rerun the command used to verify service connection to see the hotels index listed in the Indexes collection. To push documents, use an HTTP POST request to your index's URL endpoint. The REST API for this task is Add, Update, or Delete Documents. Paste this example into PowerShell to create a $body object containing the documents you want to upload. This request includes two full and one partial record. The partial record demonstrates that you can upload incomplete documents. The @search.action parameter specifies how indexing is done. Valid values include upload, merge, mergeOrUpload, and delete. The mergeOrUpload behavior either creates a new document for hotelId = 3, or updates the contents if it already exists. "description": "Close to town hall and the river"
Set the endpoint to the hotels docs collection and include the index operation (indexes/hotels/docs/index). Run the command with $url, $headers, and $body to load documents into the hotels index. Results should look similar to the following example. You should see a status code of 201. For a description of all status codes, see HTTP status codes (Azure Search). This step shows you how to query an index using the Search Documents API. Set the endpoint to the hotels docs collection and add a search parameter to include query strings. This string is an empty search and it returns an unranked list of all documents. Run the command to send the $url to the service. Results should look similar to the following output. Try a few other query examples to get a feel for the syntax. You can do a string search, verbatim $filter queries, limit the results set, scope the search to specific fields, and more. # Return only the `hotelName` field, "Roach hotel"
# Returns the `hotelId` and `description`. Two documents match. You should delete the index if you no longer need it. A free service is limited to three indexes. You might want to delete any indexes you are not actively using so that you can step through other tutorials. Try adding French descriptions to the index. The following example includes French strings and demonstrates additional search actions. Use mergeOrUpload to create or add to existing fields. The following strings need to be UTF-8 encoded. "description_fr": "Meilleur hôtel en ville"
"description_fr": "Hôtel le moins cher en ville"